This application analyzes technology characters of frequency inverter and its energy saving effect. Combining technics characters of condensing pump, it makes energy saving estimation. The power plant has 8 machines with capacity of 1280MW. In order to abide by state policy of energy saving and emission reduction, the plant planned to make reconstruction with frequency inverter for condensing pumps of two 300MW machines. The system is composed of three medium voltage isolators QS1, QS2 and QS3. QS2 and QS3 are mechanical interlock. They cannot close simultaneously. When motor runs in variable frequency, QS1 and QS2 close, QS3 opens. When motor runs in direct on line, QS3 closes, QS1 and QS2 open. 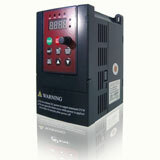 Advantages: There are obvious points of power off for frequency inverter maintenance, which can ensure personnel safety. Bypass circuit can switch load to direct on line. Price is low. Before using medium voltage frequency inverter, water level of condenser is adjusted by changing outlet valve opening. Linearity is inferior and lots of energy wastes on valve. In the meantime, frequent operation on valve leads to valve reliability down, affecting stable operation of system. Power saving is evident. Following is operation data. Compare before and after currents, we find current lowers greatly. Following is statistic of power consumption in a month. Through analyzing condensing water pump system of Thermal Power Plant, we think it is feasible to reconstruct with frequency inverter for two pumps. Changing valve control to variable speed adjustment can reach purpose of lowering power consumption rate. 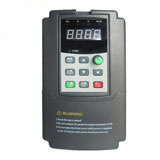 Frequency inverter also brings benefits in terms of safety, reliability and equipment maintenance.